The ceremony took place in Santa Marta, Colombia, on July 14, at Fundehumac’s Museum and Training Center. There were 16 students who received scholarships and this time female students surpassed the males. 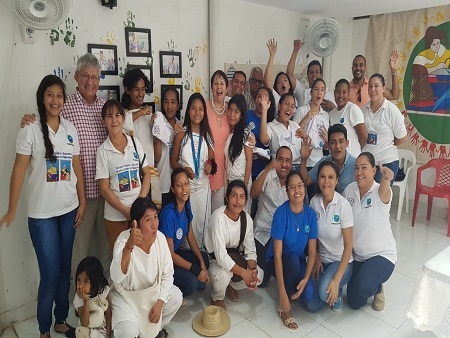 There are two female students in fashion design; one Wayuu female studies culinary arts and one girl is a tourism and hotel management major; one Wiwa girl is a Spanish major and she is already teaching in her community’s elementary school. Another Wiwa girl is enrolled in a nursing school. Six scholars, four girls and two males will become teachers. One Wayuu young man studies psychology. A male student is a library sciences major and another is a civil engineering student. Another girl is a business administration major. Elkin Boto who is the music teacher of the girl’s percussion group will graduate at the end of July as a computer technician teacher. Minoska will graduate from the teacher’s academy in December. Presently, the MFI seeks to encourage short study programs that will enable our scholars to join the work force as early as possible.